Phindy's challenge this week is to have some kind of embossing on your card. 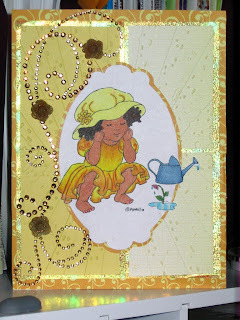 I used Tim Holtz Rays embossing set so that it could look like the sun, hence all the yellow. The digital stamp is, of course, Phindy's, called Patience, it is part of her Summer Cuties collection. I absolutely love this image, and the rest of the Summer Cuties collection, who could resist them. Go by her shop and check them out, you'll fall in love with her images. I'm also entering this card into several challenges over at the CDAC site and this will be my second entry into Paper Sundaes, Layer it up challenge! So sweet! Love the image and the swirls are fantastic too! What a lovely glowing card! Love all your glittering touches and the sweet coloring of the image. Thanks for joining us for Phindy's Friday! Oh my, this is too cute! Thanks for playing at Paper Sundaes. Absolutely wonderful, such lovely design and beautiful colouring, love the sparkle! Lovely card-beautiful colors and embossing! Thank you for joining us this week for the Phindy's Place Challenge! Thanks for joining us at Phindy's Place challenge. So beautiful!! I really love the richness of this card. FABULOUS!! Thank you for joining us at Phindy's Place!! What a lovely sunny, summery card!